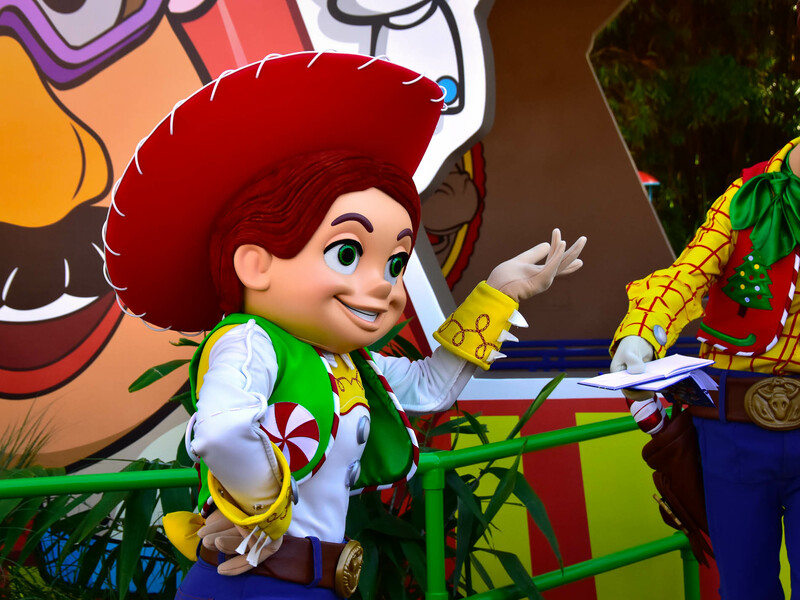 In 2018, AAA named the Orlando International Airport as the most popular destination in the country for the Thanksgiving holiday, and a good part of those travelers coming to the area were probably guests spending time and hard-earned dollars at Walt Disney World. 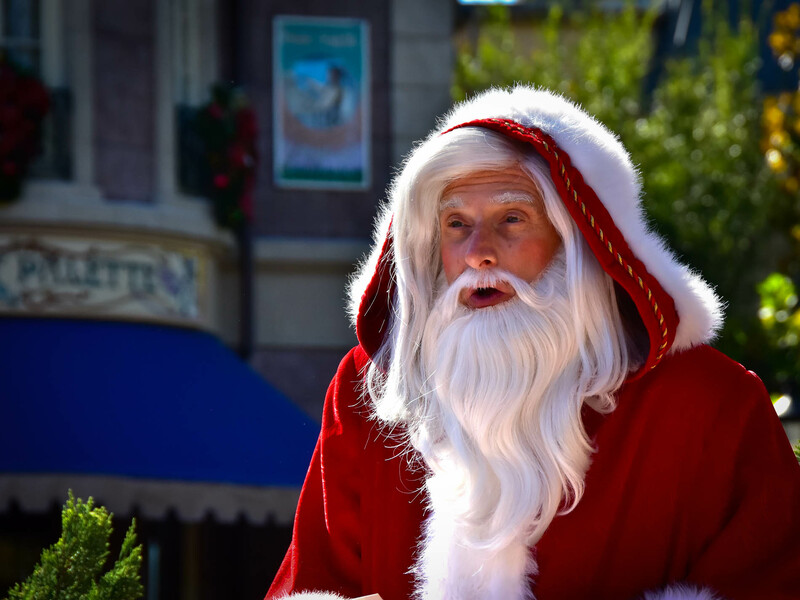 There's a good reason for wanting to come here and visit "The Mouse" during this time of year; not only is the weather starting to become somewhat palatable with summer winding down, but Disney makes an effort to bring the holidays to everyone in a big way. For this month's photo tour, we spent some time moving around the property getting updated images of some of the decorations and preparations Disney has made for the holidays, and here are some of the things we found. There isn't a more iconic holiday view of the Magic Kingdom than to see the Christmas tree at one end of Main Street USA and the castle at the other. Photo by Donald Fink. 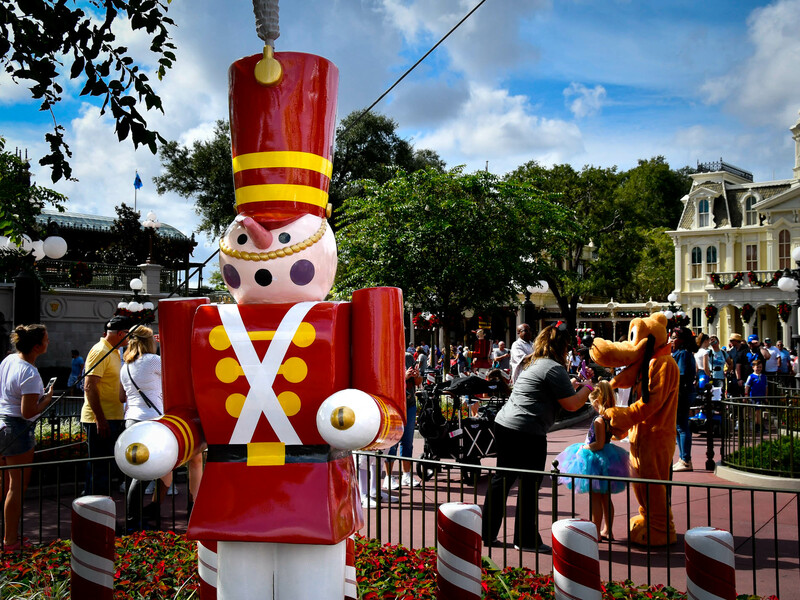 It's a tradition, and indeed almost a requirement, to have the toy soldiers on full display during the holidays at the Magic Kingdom. 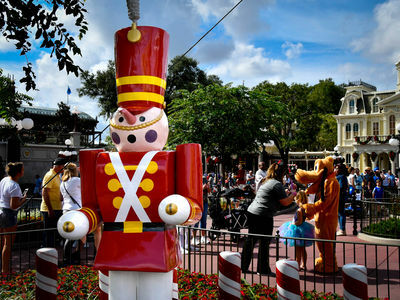 You'll see these soldiers around the tree at the head of Main Street USA, in the parade as a marching band, and even occasionally outside the park greeting guests as they debark from the ferry. Photo by Donald Fink. Cinderella's Castle at night is always something to see, but around the holidays, the lighting is literally over the top. 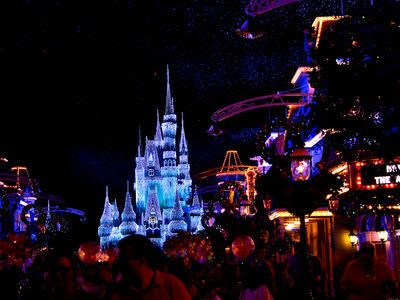 The castle lighting is not a projection, but instead, you'll find individual lights hung from just about every surface. As you might imagine, the lights change colors and are even choreographed for the various shows that are displayed with the castle in the backdrop. Photo by Bonnie Fink. 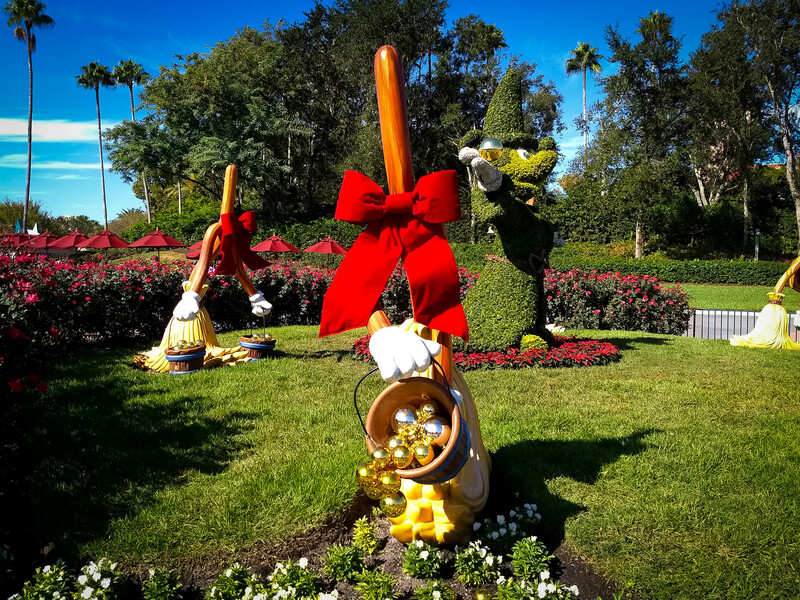 At the entrance to Hollywood Studios, you'll see a Mickey topiary—shown here in the background—as the Sorcerer's Apprentice commanding magic brooms full of golden tree ornaments. Photo by Bonnie Fink. 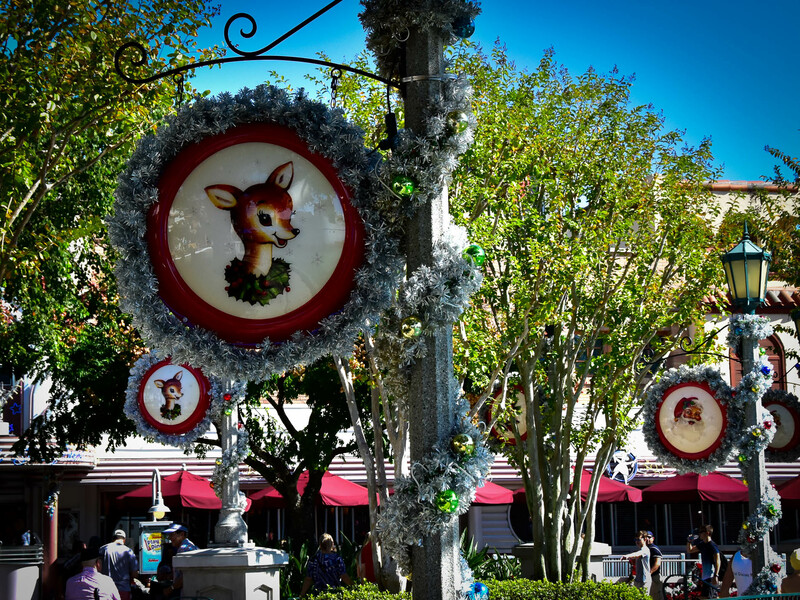 These retro decorations around Hollywood Studios have a look and feel of real porcelain tree decorations. Photo by Bonnie Fink. In Hollywood Studios, much of the holiday theming is consistent with the time period of mid-last-century Hollywood, like these full size vintage ornaments. Photo by Bonnie Fink. The tree at Echo Lake in Disney's Hollywood Studios sits on the island. 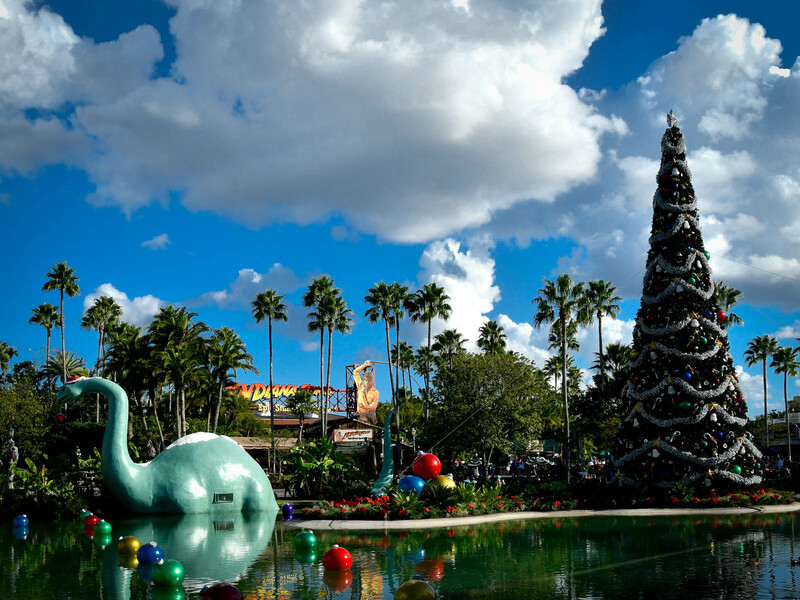 You can see lighted ornaments floating here and there on the water as well as a new holiday hat for Gertie, the dinosaur. At sunset, there's a brief tree lighting ceremony that's fun to watch if you're in the area. Photo by Donald Fink. At Toy Story Land, Rex, the T-Rex toy has been decorated as a reindeer. Photo by Bonnie Fink. Jessie is sporting a new holiday vest in Toy Story Land at Disney's Hollywood Studios. Photo by Bonnie Fink. The Green Army Men in Toy Story Land appear to be more or less normal, except that each soldier is wearing a holiday scarf. We call the style "holiday camo." Photo by Bonnie Fink. 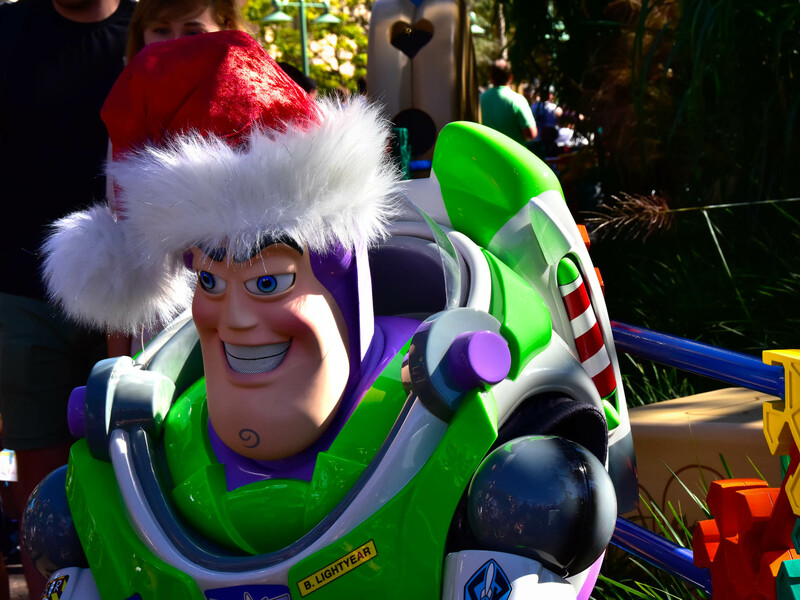 Buzz Lightyear has a new holiday hat as he poses for pictures with guests. Looks like he just came from a Toy Story office party. And by the way, is it just us, or does Buzz Lightyear have a bit of a sinister look about him these days? Photo by Bonnie Fink. We found Santa Goofy on Grand Avenue, near the entrance to the soon-to-be Star Wars: Galaxy's Edge, taking pictures with guests. Photo by Bonnie Fink. Meet Santa Claus at the Holiday Character Greeting on Hollywood Boulevard. 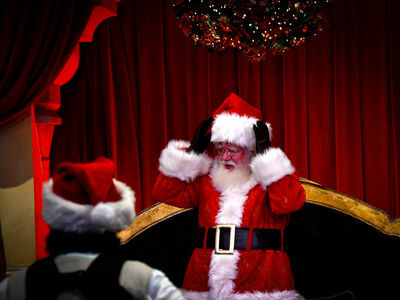 Santa will be there until December 24. 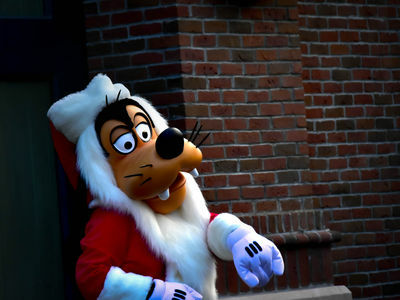 After that, Santa Goofy will be available until January 6. Photo by Donald Fink. 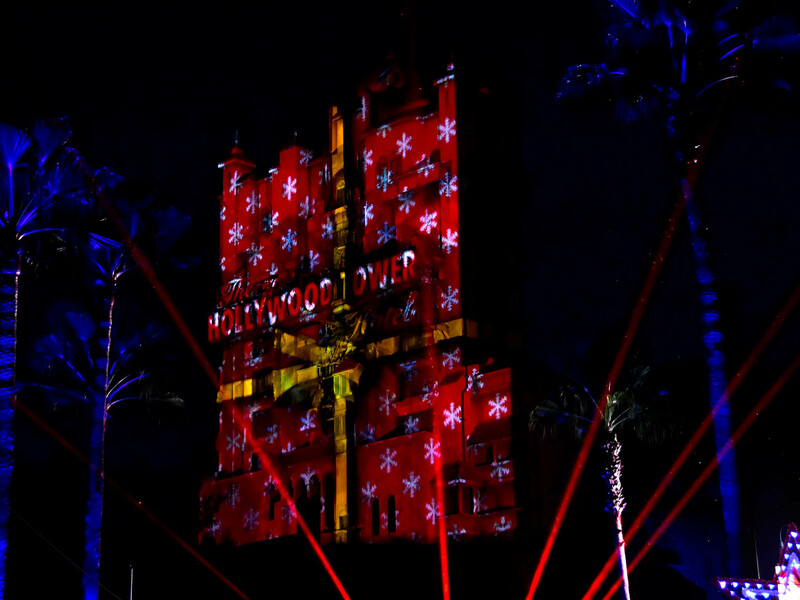 In the evenings this time of year, the Hollywood Tower Hotel comes alive with the show, Sunset Seasons Greetings. 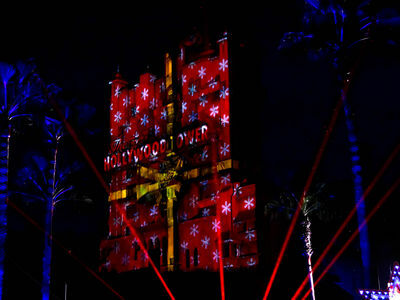 Images are projected on the tower while lasers strobe down Hollywood Boulevard. The decorations along the street are synchronized with music, as snow floats down from above. Photo by Bonnie Fink. 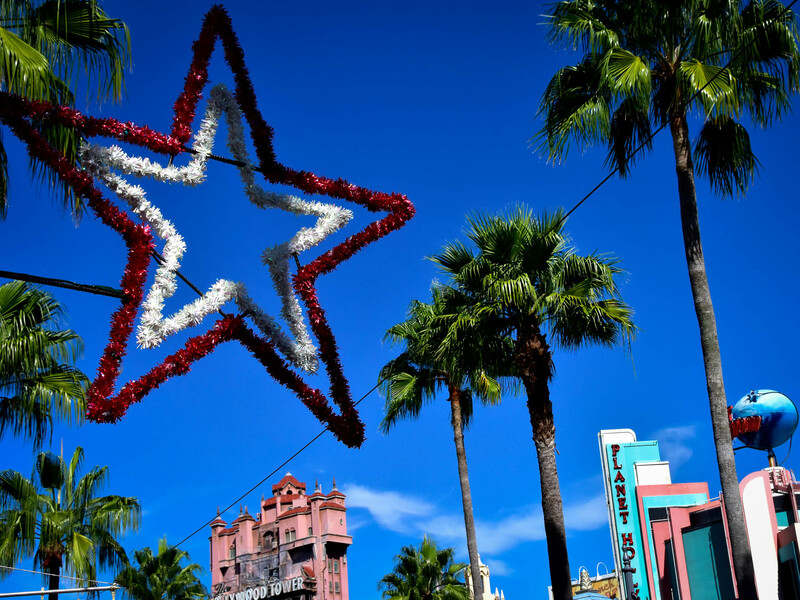 Decorations along Sunset Boulevard at Disney's Hollywood Studios play a role in the evening performances of Sunset Seasons Greetings. Each one is a bit different, but they're synched with the music and other lights as the performance plays out, adding to the experience. Photo by Bonnie Fink. 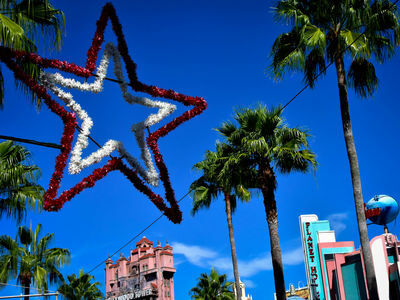 The star of the holidays at Disney's Hollywood Studios is the dazzling show, Jingle Bell, Jingle Bam: a combination laser, projection, and fireworks display centered on the Chinese Theatre. Here is a brief clip of the show. Video by Donald Fink. Epcot has almost too much to cover in one article. 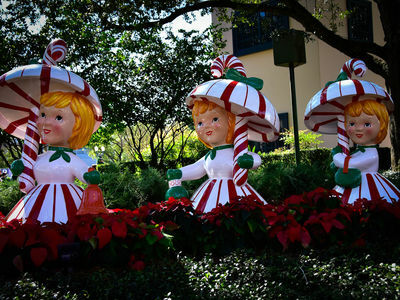 This time of year is right at the end of the International Food and Wine Festival, and almost without missing a beat, Disney jumps right into the International Festival of the Holidays. Many of the temporary food stands are left up and re-purposed with foods from around the world for the holidays. 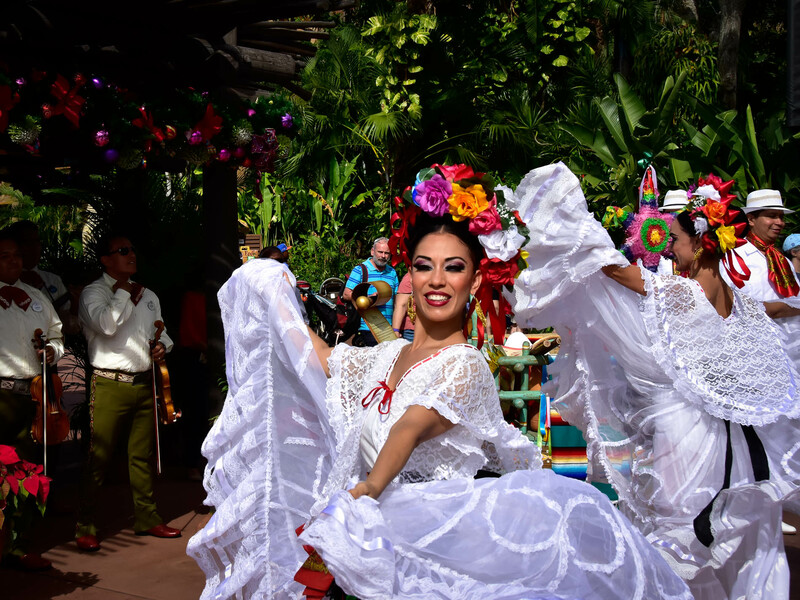 Our favorite activity at Epcot during this time of year is to walk around World Showcase and watch the various storytellers as they describe traditions and stories from their countries and cultures. The dancers are back at the Mexico pavilion, performing several times a day to the music of Mariachi Cobre, the long-time resident mariachi band at Epcot. 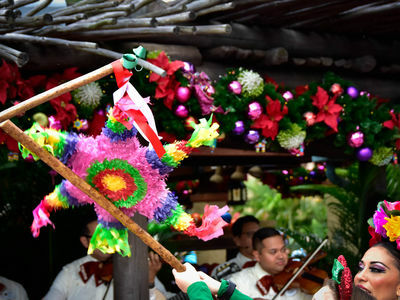 Several dances are performed from different states in Mexico, including a re-enactment of the Latin American holiday tradition of Las Posadas. Photo by Bonnie Fink. During a performance from the dancers at the Mexico pavilion, children are treated to a turn at the Mexican tradition of la piñata. Photo by Bonnie Fink. A piñata, in case you don't know, is a container of some kind, usually a colorful animal or object (in this case, a star), that's filled with candy. Children take turns with a stick trying to break the piñata open, spilling the candy out on the ground. In this example at Epcot, the children are given treats regardless of the outcome of the piñata. The Voices of Liberty have a great show at the American pavilion in Epcot pretty much any time of year, but during the holidays they change things around a bit and perform songs from the holidays. In this video, they are singing a Peter, Paul, and Mary song, "Light One Candle," that commemorates the struggle of the Jewish people against the Greek Empire and recognizes the observance of Chanukah. Video by Donald Fink. In France, the story of Father Christmas, or Père Noël is told. Photo by Bonnie Fink. The Bûche de Noël au Chocolat, or Christmas chocolate log, is offered at Le Marche de Noël holiday kitchen in the France pavilion. It has a caramel ganache in the center and chocolate ganache on top. Photo by Bonnie Fink. The Italian story of La Befana centers around an old woman—some say a witch—who visits children on the eve of the Feast of the Epiphany, on January 6. The story has familiar elements to it: Children who are good will receive toys, gifts, or candy. The not-so-good kids get coal, dark candy, or a stick in their stocking. This video runs a bit longer than we normally like, but we think it's worth a few minutes to see this compelling tale. Video by Donald Fink. The Candlelight Processional at Walt Disney World is performed at the American Gardens Theatre in the American pavilion at Epcot. 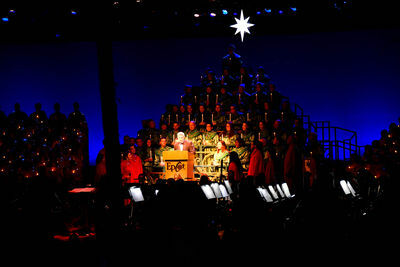 The show uses a full orchestra and a massive choir, including the Voices of Liberty, to tell the Christmas story. The story is narrated by a current, popular celebrity. Photo by Donald Fink. 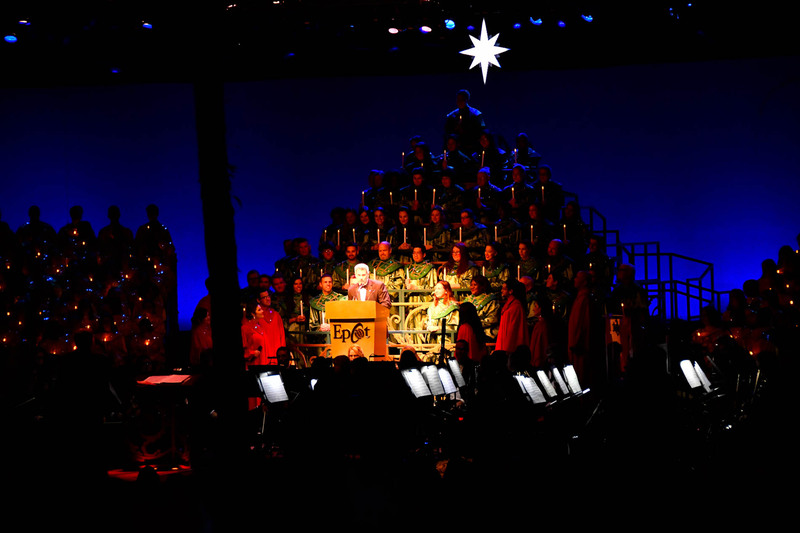 The Candlelight Processional is a performance of the Christmas story, and has been a part of Disney since 1955 when it began at Disneyland. Today, the show appears on both coasts, using an orchestra, a large choir, and a celebrity narrator to tell the story. This year, the narrators at Epcot include Neil Patrick Harris, Whoopi Goldberg, and Gary Sinise. There are 15 different narrators at the Walt Disney World version of the performance. The performance at Epcot is free, but you can get preferred seating by purchasing a dining package. Whether you opt for the dining package, or just drop by and catch the performance, the show is worth the visit. We've seen it many times over the years, and it never gets old. 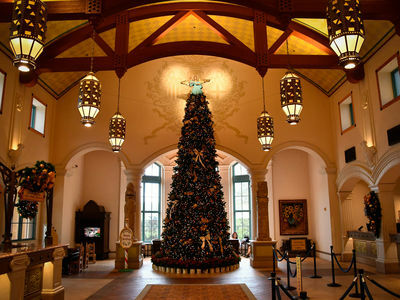 Disney's Animal Kingdom doesn't go all in for the holiday decorations, but they do include a tree at the entrance. 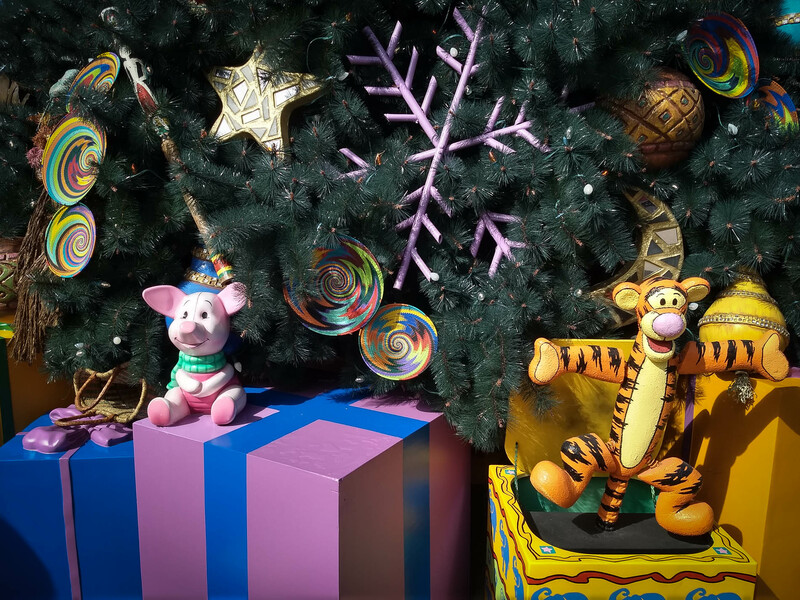 If you visit Animal Kingdom during this season, spend some time at the tree looking at the friends of Winnie the Pooh and the African-inspired decorations. Photo by Bonnie Fink. 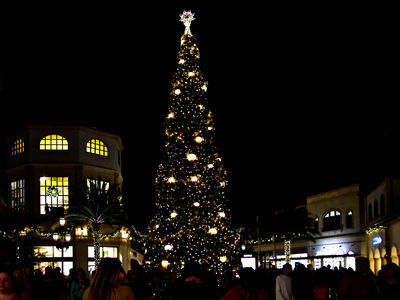 At Disney Springs, the main Christmas tree is located in Town Center. If you arrive in the Springs by bus, it's inside the Town Center as you enter. From the Lime Garage, it's a left turn at the fountain. 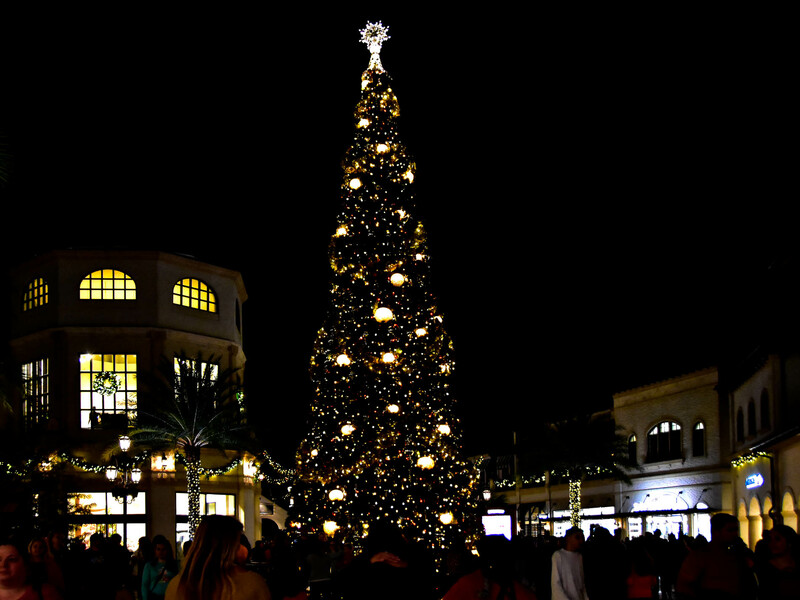 The Town Center tree is a spectacular site at night. Photo by Bonnie Fink. 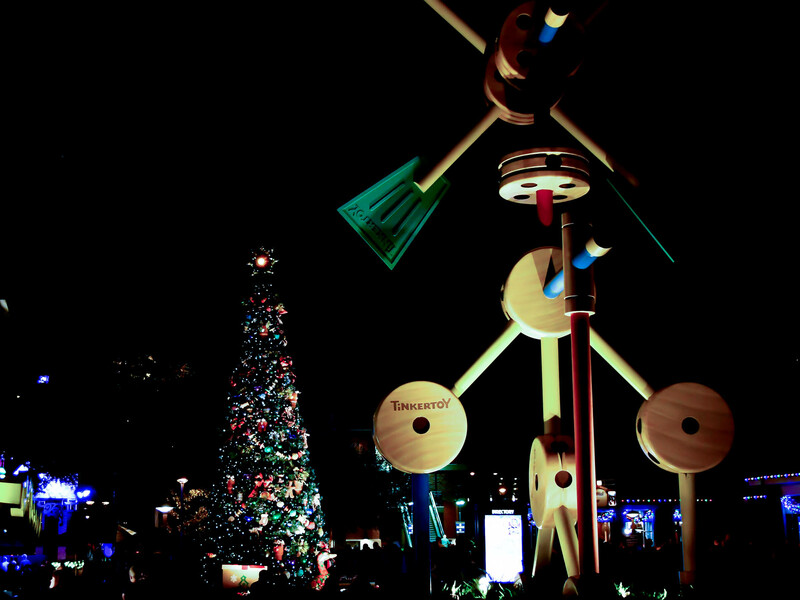 There's another Christmas tree at Disney Springs in the Marketplace, near Earl of Sandwich and the Play Fountain. Photo by Donald Fink. When you pass by one of the trees at Walt Disney World, take a few moments to stop and look at the individual decorations. These trees are intricate and full of Christmas symbolism and meaning. 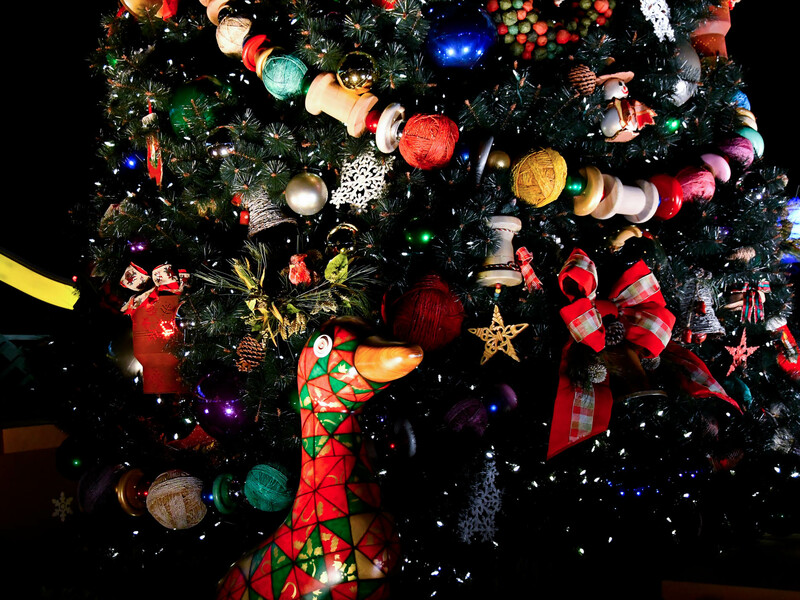 This tree—located near Earl of Sandwich in Disney Springs Market Place—is adorned with ornaments that resemble homemade items, possibly from everyday merchandise that could be obtained from the local stores. In this image, you can see what appears to us to be a Partridge standing next to the tree. Photo by Donald Fink. 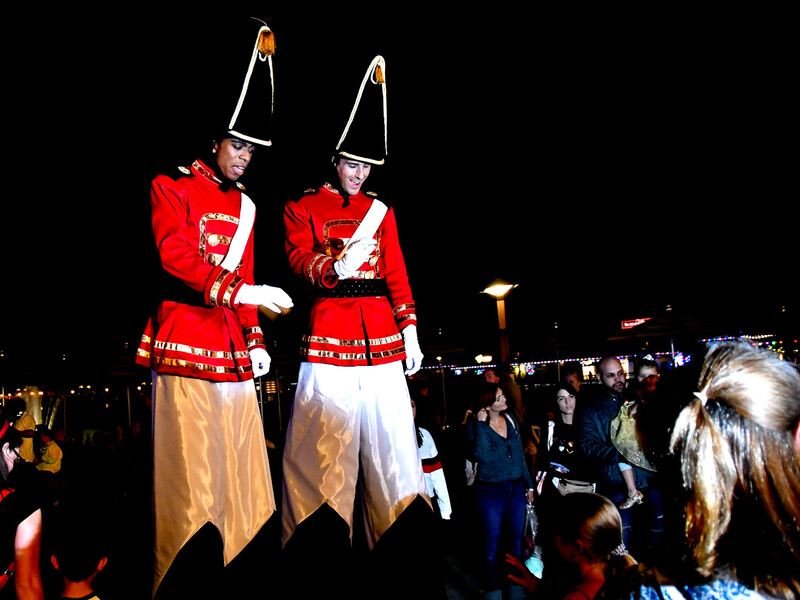 These soldiers on stilts were just standing around Disney Springs taking photos with guests. They were at Ghirardelli's in the Marketplace, standing in a spotlight, probably to make it easier to get a good phone picture. The interesting part was watching them walk through the Saturday night crowds when their time on set was over. That takes skill. Photo by Donald Fink. 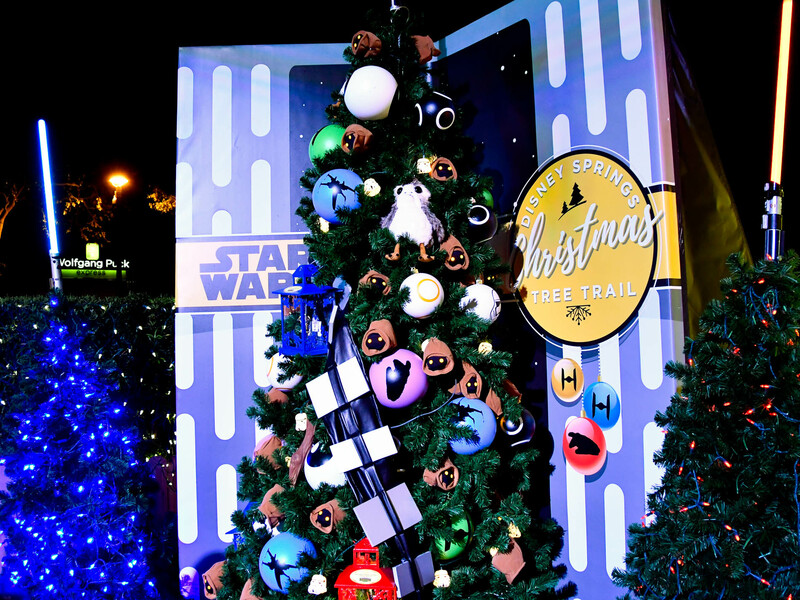 The Christmas Tree Trail is located in Disney Springs, at the Marketplace. It begins by the Play Fountain and winds its way through photo ops of Disney-inspired and themed trees. 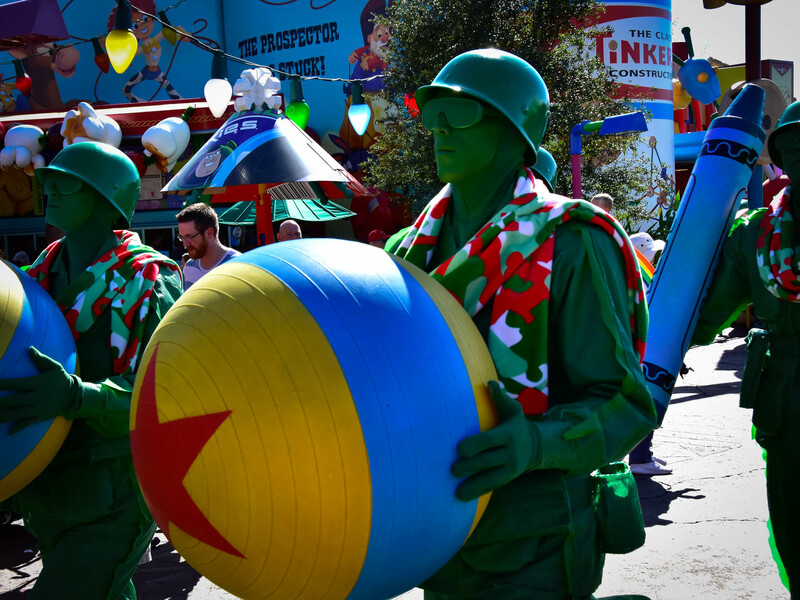 There are over 25 different themes along the journey, including Fantasia, Mary Poppins, The Muppets, and Star Wars. This self-guided walking tour is well lit and suited for phone pictures. The best photo experience is definitely at night. Be sure to set your cameras to auto white balance, and for those using DSLR cameras, don't be afraid to let the exposure drop a couple of stops below normal. 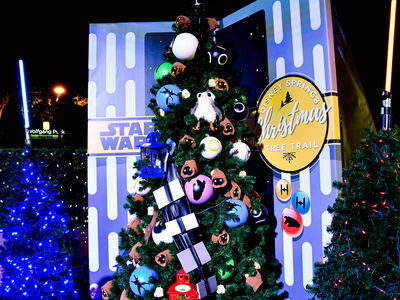 Notice the Jawas tree decorations on this Star Wars tree. Photo by Donald Fink. 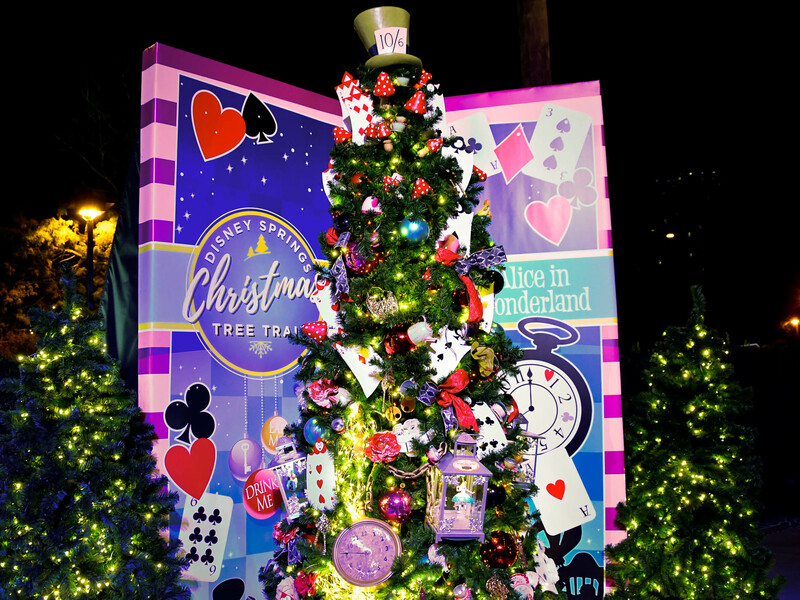 Here's an Alice in Wonderland themed tree at the Disney Springs Christmas Tree Trail. 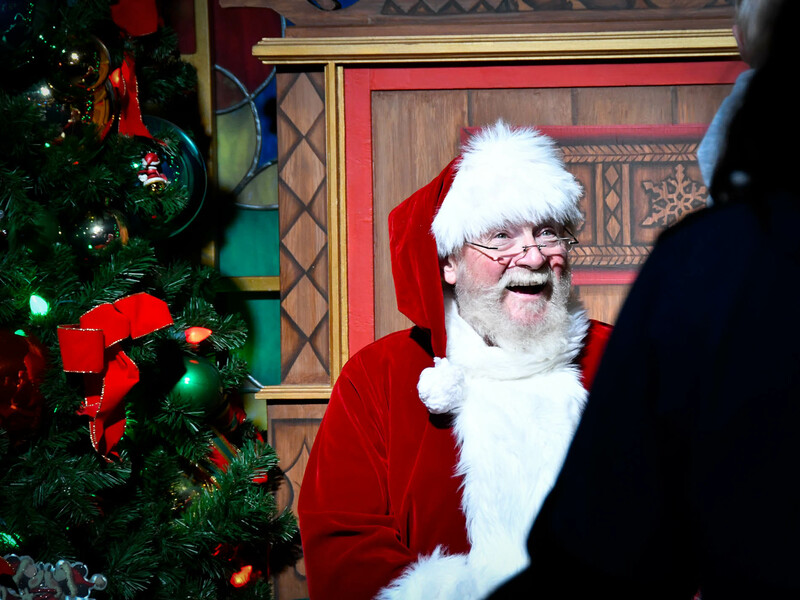 Entrance into the Christmas Tree Trail is free, but can get extremely busy at times, so cast members are on hand to regulate the flow of guests, keeping things manageable. Photo by Donald Fink. Santa is everywhere this time of year. Must be some of that Santa and Disney Magic. Photo by Bonnie Fink. 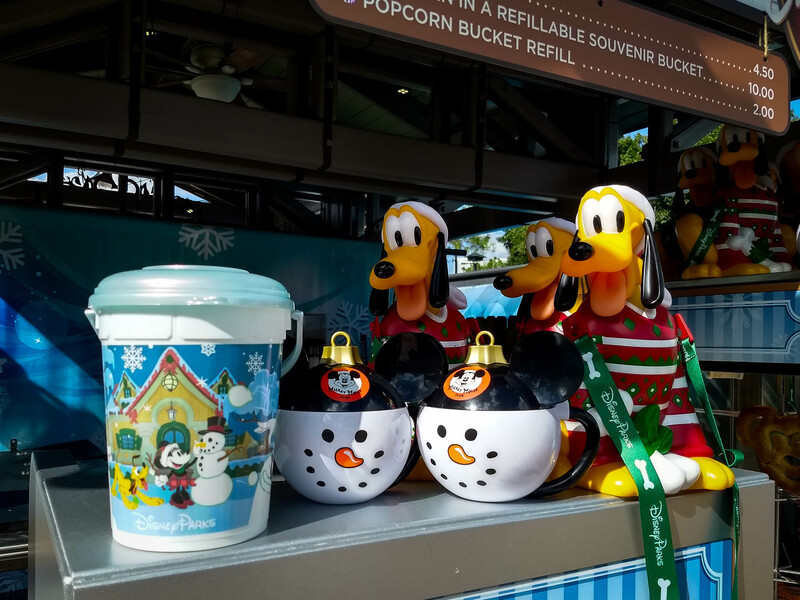 These souvenirs are all around Walt Disney World, but we found them in one easy to photograph spot at Disney Springs. They are, a refillable popcorn bucket (left); Frozen Hot Chocolate and Frozen Eggnog cups; and a Pluto Popcorn bucket. Photo by Bonnie Fink. 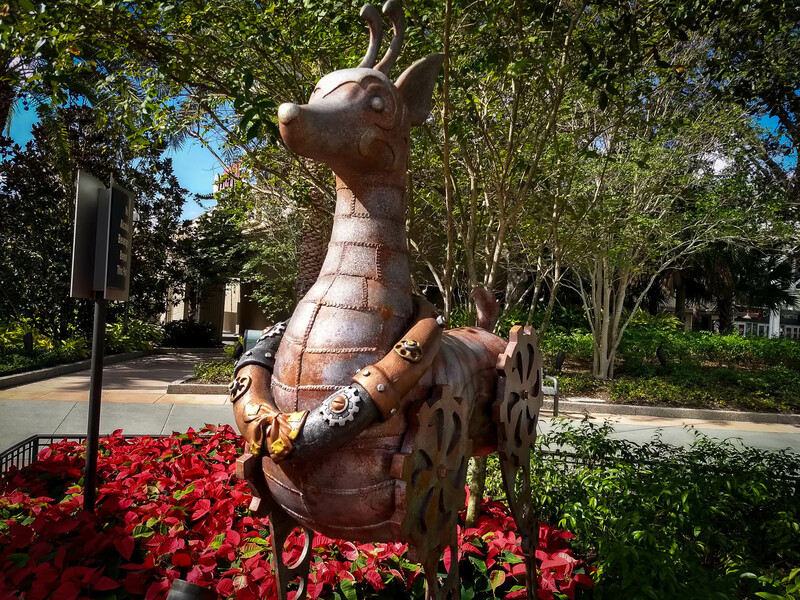 You can find steampunk inspired reindeer near the Orange Garage in Disney Springs, West Side. Photo by Bonnie Fink. Here is a family of whimsical Peanut Reindeer. They're located in Disney Springs, Marketplace, near the Coop. 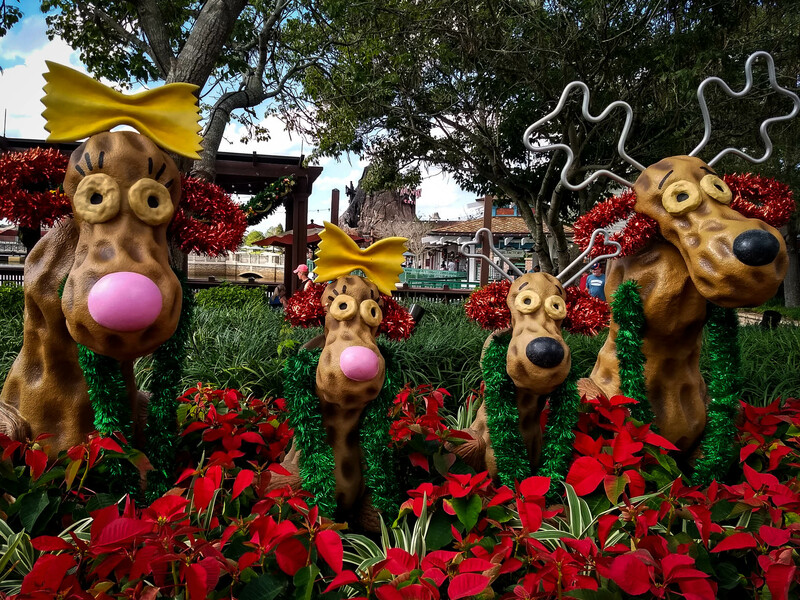 We're calling these guys reindeer to be in the spirit of the holidays, but truthfully, to us, they look more like Peanut Holiday Moose. Photo by Bonnie Fink. 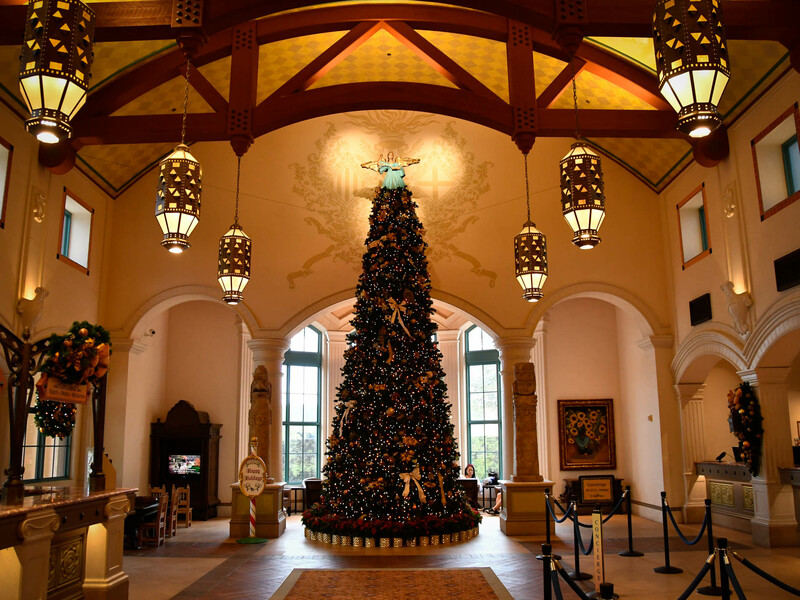 The Christmas Tree at Disney's Coronado Springs Resort is in the main lobby. Normally, you can easily see the "hidden Mickey" in the form of three spotlights projected on the back wall. As it turns out, those lights do a more than adequate job of highlighting the angel at the top of the tree. Photo by Donald Fink. 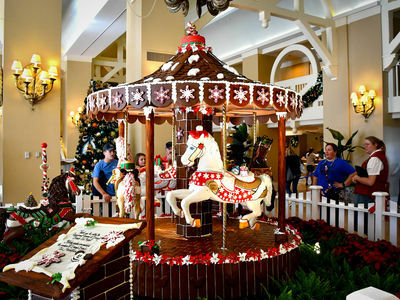 The gingerbread carousel has been at Disney's Yacht Club for the past several years. This time, it's located at Disney's Beach Club Resort, but seems to have the usual high degree of detail and overall design. Each horse is carrying gifts in its saddle. This one in the foreground has two gifts, one for Dewey, and one for Daisy. Photo by Bonnie Fink. The horses on the gingerbread carousel at the Beach Club have an incredible amount of detail. This one, made from white chocolate, has a mane shaped like individual leaf pedals. 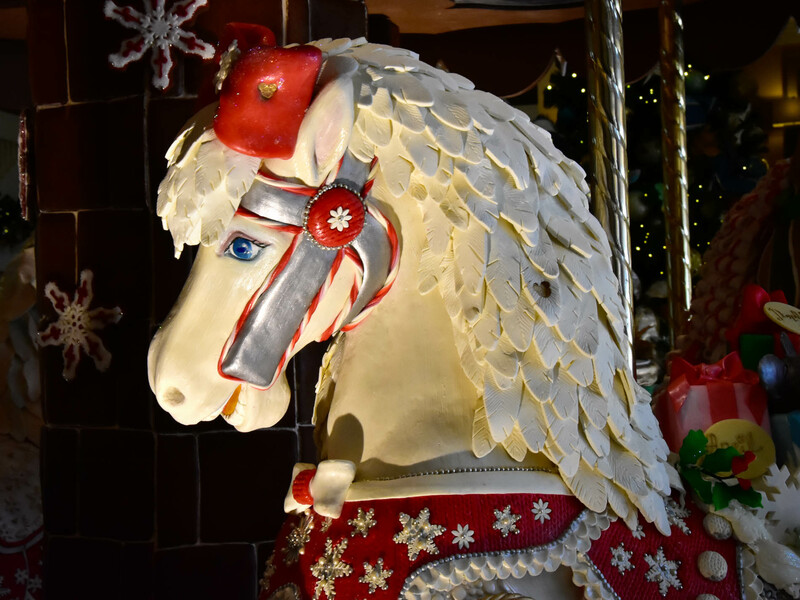 Can you spot the hidden Mickey on this horse? Photo by Bonnie Fink. There's also a bake shop inside the Grand Floridian's gingerbread house where you can find gingerbread ornaments, cookies, and even gingerbread house kits. Photo by Donald Fink. Several hotels display gingerbread houses during the holidays, but none compare to the gingerbread house that's constructed each year in the lobby of the Grand Floridian Resort. This is the 20th year that the gingerbread house has been displayed. 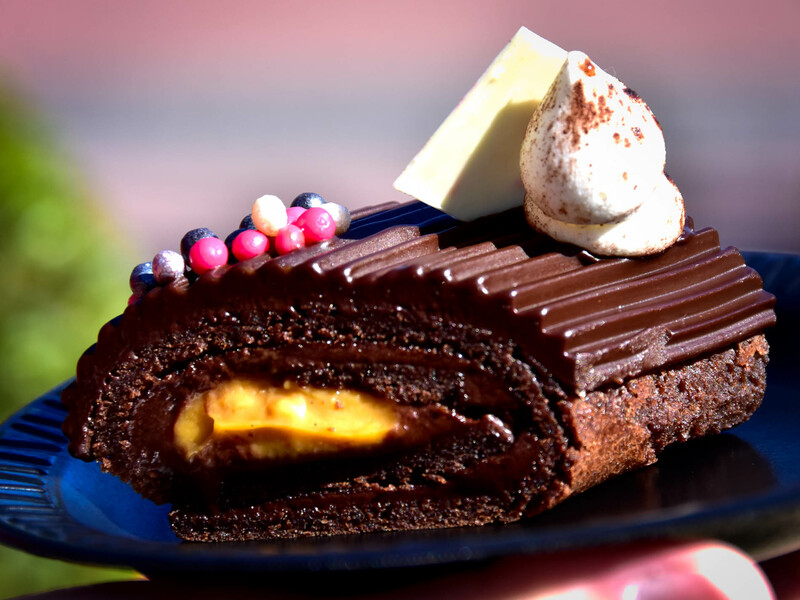 Each year, Disney chefs spend 400 hours baking, followed by 160 hours constructing and decorating the house. 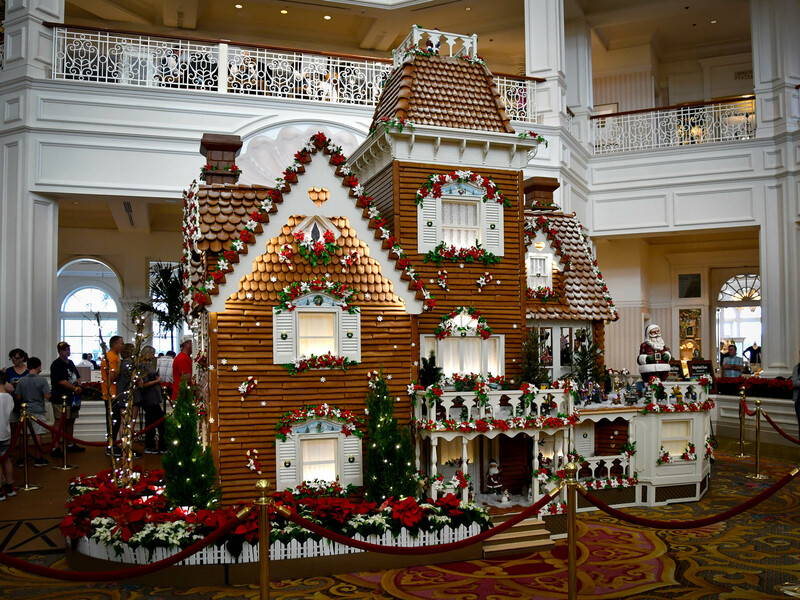 Even if you're not staying at the Grand Floridian, it's easy to see this mega-gingerbread house. If you visit the Magic Kingdom, you can take a monorail (use the Resort Monorail Line) to the Grand Floridian. The monorail stops on the second floor of the hotel's lobby, where you can get a top-down view of the gingerbread house. After you stop at the Grand Floridian, you can either take a bus or monorail back to the Magic Kingdom where you can catch a bus to your resort, or grab a monorail ride to the Ticket and Transportation Center to get back to your car. All the hotels on Disney property have at least a tree on display this time of year. Disney's Fort Wilderness Campground has a tree too, but the real treat is that many of the campers put out decorations at their campsites. For some, they bring utility trailers behind their RVs to carry all the decorations. We've even seen some campers using their own generators instead of the electricity provided at the site. Apparently, they use more power for their decorations than what's available at the campsite. It's an easy boat ride from the Magic Kingdom to get to the campground, and great fun to walk around and see the decorations. You could make an evening out of going to Fort Wilderness Campground with an early seating of Disney's Hoop-Dee-Doo Musical Revue, then take a horse-drawn carriage around to see the decorated campsites. After that, ride a boat back to Disney's Magic Kingdom for fireworks. There's more than one gingerbread display too. In addition to Disney's Grand Floridian Resort, you can find gingerbread works of art at Disney's Contemporary Resort, Disney's Boardwalk, and Disney's Yacht and Beach Club. We could go on for many dozens, if not hundreds more images showing the highlights of Walt Disney World during the holidays. Many of the displays are the same year after year, but some are new each year too. 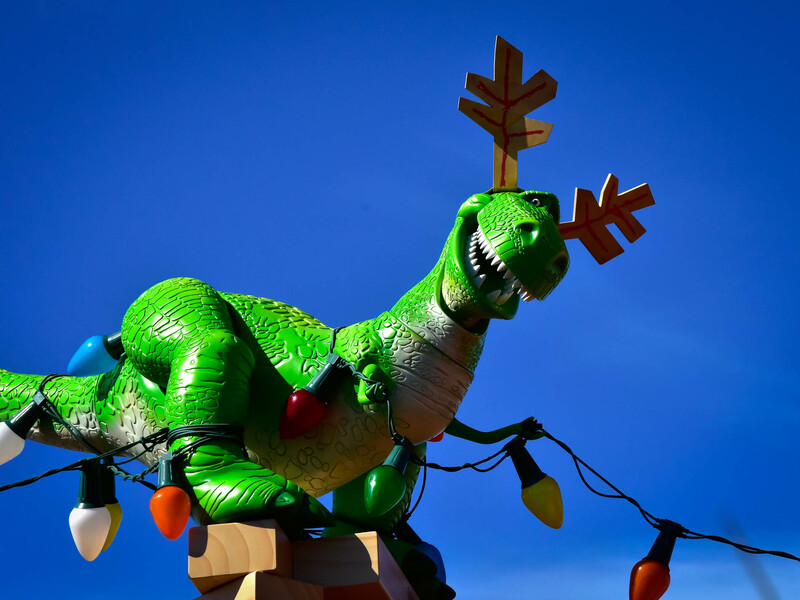 Not only is this one of the most festive times here, but the weather usually starts to cooperate, which makes visiting the parks just that much more fun. For us Floridians, we even start to think about getting our long pants out, at least in the evenings.